Today Ashley and I had a chance to go visit two local waterfalls in the Trabuco District of the Cleveland National Forest, one of which was Ortega Falls. 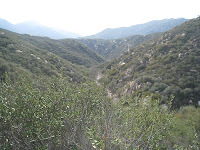 Ortega Falls is located only a short hike away from Ortega Highway. At the trailhead to Ortega Falls, which is basically a turnout for Ortega Highway, you can even see the waterfall. This is a great waterfall to visit for those looking to get out and see one of our local waterfalls because it is easy to get to and is a short hike. 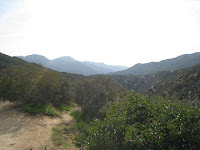 Directions to Trailhead: To get to the trailhead for Ortega Falls, if you are coming from Orange County, take Ortega Highway (74) going towards Riverside. The parking lot to hike to Ortega Falls, which is a dirt parking turnout, is located a little bit passed the Ortega Oaks Candy Store. It is the next major trailhead area after a big S curve in the highway. There is parking on both sides of the road, however the trail starts on the left side of the road coming from Orange County. If you hit El Cariso Village, you have gone too far. A map of the location can be found in the Google Map below. 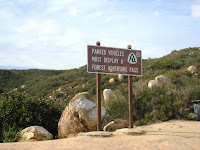 A Forest Adventure Pass is needed to park at the trailhead to Ortega Falls. One can be purchased at the Ortega Oaks Candy Store or in El Cariso Village. Description of Hike: This is a fun short hike, at roughly a half of mile roundtrip. The hike to Ortega Falls is an our and back hike. Ortega falls is more of a series of cascades as opposed to one waterfall. The series of cascades are not viewable while driving on Ortega Highway, however once you stop at the trailhead and look over the side, the falls are readily visible. There are two options to get to the series of cascades that are in the valley. The first option is the trail to the left of the sign post (indicating parked vehicles must display a Forest Adventure Pass). On this route, there are multiple trails to get to the bottom where the series of falls are located. They are steep trails, so be ready for a workout coming back up. Also the area at the bottom has a lot of rocks, so be careful because they are slippery when wet. On this first route you have a series of scrambles to get from one fall to the next. The second option is the trail to the right of the sign which will take you to the upper area of Ortega falls and it is not quite as steep. Just keep right on this trail. Further Thoughts: If you are going to see the Ortega waterfall when it is flowing make sure there has been some decent rain or an above average rainy season in Southern California. The winter months of January, February, and March are probably the best time to visit Ortega Falls falls in the Cleveland National Forest. The falls will usually be dry or only a trickle during the summer months and fall. There was plenty of water when we went because we had about 8 inches of rain during the month of January. Be careful going down the trail to Ortega Falls, as it is steep. One negative about this hike was the amount of trash that was on the trail. Ashley and I didn't know if this was simply because the trail was close to the road, or because visitors were just being irresponsible on such a short trail. One thing that Ashley and I have been doing recently is carrying a bag with us to pick up trash we find on the trails we hike. I am always surprised at what we pick up while out hiking. For those looking for an easy way to give back to our Southern California wilderness areas, a good option is to bring a bag and pick up after those whose carelessness distracts from the beauty that abounds in Southern California. On a more positive note, it is always amazing to see Southern California after it has received plenty of rain. 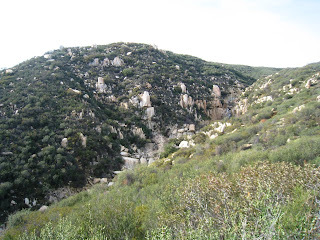 The wilderness here in the Santa Ana Mountains is a totally different experience than in the dry summer months. With ample rain comes the sounds of rushing streams filled to the brim with water, frogs, and other local wildlife. The chaparral community comes alive after receiving rain. We are truly blessed with such great areas to hike at in Southern California. Rating: Elevation Gain: 300 ft. (Easy), Distance: 0.5 Miles Roundtrip (Easy). Time to Complete Hike: 45 minutes to 1 hour. Hm. Do you think this hike would be appropriate for kids, say 11 and 8, who are comfortable hiking? I would imagine that the hike would be alright, as long as they are comfortable hiking. It is a short trail, but is steep leaving the parking area. If you arrive and decide it is too much, the San Juan Loop trail just down the way would be a perfect alternative. The San Juan Loop trail is on our list of Fun Short hikes. Great information! I live in El Cariso Village and am planning a hike here this weekend. I am using your blog to show my friends where to meet me. Thanks for the great site. My wife and I had a fun time doing this hike. But there was indeed a lot of trash and graffiti, we carried out two bags of garbage. Thanks for this awesome info! I decided to go here yesterday 6/6/11 so I looked it up real quick and pulled this up and went, found it perfectly with no problem at all. The water is still flowing good. This is the shortest hike I've ever done but very rewarding, there are just a little steep spots like you said. We went all the way down and climbed up to the top waterfall but I dont recommend that. There were little kids at the main upper fall and its a good trail to take kids on too, just be careful. does anyone know if the falls are still active right now? (7/12/11)? Where could I call to find out? David, we don't know how much water Ortega Falls has in it at this point. The last time we were there was in Late May and they had plenty of water then. Hopefully, someone can help you out. You can also post the question on our Facebook page. Additionally, you can try and message the Ortega Highway Candy Store's Facebook page. Ortega falls is a popular rock climbing area, so it gets high use.